Also called the “Chinchona of China” or “the wonder of the world root”. In China ginseng is considered the main herb as a male tonic. In China, ginseng is held in high repute, and the prices they realize are dependent upon the extent to which they resemble the human form. With the exception of teas, ginseng is the most celebrated plant in all the Orient. The Chinese have great faith in its curative and strengthening properties and call it the “Chinchona of China”. The Manchurian Ginseng comes from the Emperor’s mother country, from the soil from which legend says sprang the `God of Heaven’. It is, therefore, regarded as more efficacious than the ginseng grown anywhere else. Roots older than two years are a famous yang stimulant (North American less so than Oriental). * Ginseng can be very difficult to grow. Germination of disinfected seeds (to kill mold, which plagues ginseng at all stages of growth) can take up to a year or more. Plant in early autumn in raised beds of very humus-rich soil. Plants must be shaded at all times. Roots are not harvested until the plants are at least 6 years old. Take care during harvesting and drying not to break off any of the “arms” of the root. Dry for one month before use. * When the plant grows wild its root resembles the shape of the human body, and like mandrake, it is thought to be most appropriate for most any magickal spell. *Ginseng is an effective substitute for mandrake in all spells. Drink ginseng tea to stir up a magnetic physical attraction. Carry it to attract love. Carry it to ensure sexual potency. Ginseng will bring beauty to all who carry it. Ginseng when burnt and used as a fumigant is potent for breaking hexes. Carry it to draw money. * Carry the root with you, in pieces or whole, wrapped in a piece of red cloth and secured with gold or orange thread. Or else keep a ginseng pouch in your living room or on your altar. For purifying home interiors, place ginseng root on your altar for three days. Then soak it in a bowl of warm water and leave it to stand overnight. Sprinkle the water from the bowl around the rooms of your home, or on the windows and doors. Sprinkle the water in the four corners of the property for protection against entities. Store the ginseng water in a spray bottle. Before you dress each morning, lightly spritz your body from head to foot. The ginseng spritz is especially helpful for those engaged in healing and psychic work. 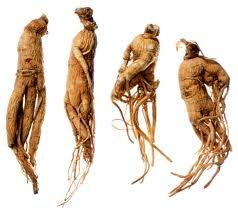 Ginseng is a tonifying herb and stimulates the body to overcome all forms of illness, physical and mental. Rather than treating specific problems, ginseng strengthens the body by increasing the efficiency of the endocrine, metabolic, circulatory, and digestive systems. It reduces physical, mental, and emotional stress by increasing oxygen-carrying red blood cells and immune strengthening white blood cells and eliminating toxins. * Ginseng is particularly useful in the treatment of young children as well as the aged. v Relief for flu symptoms. Ginseng boosts the body’s synthesis of nitric oxide. As NO increases, so does the likelihood of erection. v When taken regularly it removes general fatigue and promotes good health. Improves hormonal functioning and as such reduces tiredness. Combined with the juices of a ripe pineapple, it is an excellent medication for indigestion. v Aphrodisiac: it is a sexual stimulant. Herbs such as Siberian ginseng increase the availability of serotonin in the brain. Ginseng has been used for various ailments but most effectively as an anti-anxiety herb. Ginseng has stimulant properties that reduce stress. It helps to maintain emotional balance. Ginseng also reduces blood-sugar levels but diabetes requires professional treatment; consult your physician about ginseng. Many athletes take ginseng as part of their training in order to significantly increase their stamina. 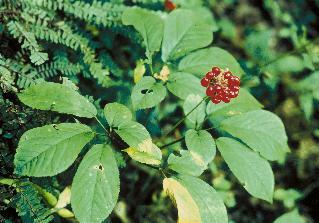 Ginseng is safe, but it does have anticoagulant action so increased bruising is possible. 10 drops of dandelion or ginseng tincture in the morning. 25 drops of motherwort or ginseng tincture 2-4 times a day. v During menopause it aids in rejuvenating the system and balances hormones, as well as aids in regulating hot flashes. * Ginseng should not be taken continuously. v Ginseng tea can be made from the dried leaves or blossoms of the herb. After the berries are gathered select the brightest, cleanest leaves from a mature plant. Place them above the kitchen stove in thick bunches turning and mixing well until they are very dry. Store away in paper sacks. When the leaves are steeped in boiling water, just like ordinary tea, the liquid may be drunk with cream and sugar if preferred. v Another recipe for general use in the home is the following: Take a piece of the root when it is very hard and dry. Break it up with a hammer and grind it through a coffee mill several times until it is reduced to a fine powder. To three ounces of the powder add one ounce of milk, sugar and sixty drops of oil of wintergreen. Mix all the ingredients well and store in a glass jar. The correct dosage in one teaspoonful to a small teacup of boiling water. When the drink is cooled it should be taken before each meal. It may also be filtered served with cream and sugar, and consumed with the meal. Made as directed this is a most pleasant aromatic tea and has a good effect on the stomach, brain and the nervous system. If the evening cup of ginseng is much larger, it is a good and safe hypnotic, producing a deep restful, natural sleep. The tincture is ready in six weeks, but gets stronger the longer it sits. I like to wait about six months before using my ginseng tincture. o Buy an ounce of dried Echinacea augustifolia or Panax ginseng root. o Put the whole ounce in a pint jar. o The dried root should fill the jar about a third full. If not, use a smaller jar. o Fill the jar to the top with the alcohol. Cap tightly and label. Searing hot temperatures have a way of sapping the energy right out from one’s body. The following energy potion can help replace this lost energy. Brew pinches of mint and ginseng herbs along with a green tea bag. Steep for three minutes. Strain and serve over ice with lemon slices for a refreshing tonic. In addition, you may wish to take Solomon’s seal, Gotu Kola and myrrh herbal supplement tablets to rev up flagging energy levels. Once restored, seal the energy inside the body by taking a cool shower and rubbing a rosewater and glycerin solution into wet skin. As you do so, visualize the energy vibrating just below the skin’s surface. Carry this vision with you throughout the day. Most importantly, make sure to drink plenty of water to keep the body hydrated and functioning at its highest level. Make a decoction of the above. To use: Drink 1/2 cup to 1 cup per day, about 3 days a week to increase energy, stamina and mental clarity. This tea is wonderful if you are going to have to use your brain for creative thoughts and mental clarity. Place the ginseng in 1 quart of boiling water. Reduce the heat and simmer, covered, for approximately 20 minutes. Remove from heat and add the remaining ingredients and steep for about 20 minutes. To use: Drink 2-3 cups per day.